Recently we were asked by Saal Digital to evaluate the quality of their wall decoration products. We elected to test their acrylic prints which are said to offer "fascinating spacial depth & reflection on surface". 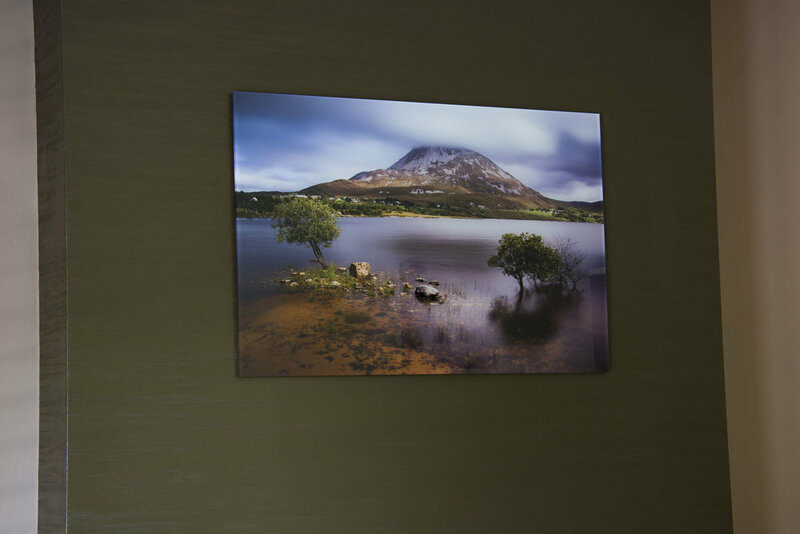 The image we chose to submit was Mount Errigal by Emma McArdle. Our goal was to test the depth of field claims by Saal Digital, as well as to evaluate the overall sharpness and colour accuracy of the product. The acrylic print itself was printed to a size of 50 cm x 75 cm behind 5 mm of clear acrylic. The price of an acrylic print from Saal Digital in this size with standard mounting is £90.90 plus a shipping cost of £5.95 to Ireland. This shipping price isn't bad considering how quickly the order was shipped and for the sturdiness of the packaging. It was wrapped in protective plastic and surrounded by thick cardboard packaging to prevent damage to the acrylic print. The print arrived in perfect condition within 3 working days of our order. The mounting was easy to install; no additional tools are needed. In terms of quality, this acrylic print has surpassed expectations. The colours are sharp and vibrant. The 5mm acrylic layer gives the print an incredible sheen from any angle. There is a notable improvement in depth of field (but I wouldn't consider the effect transformative). Ultimately the quality of the acrylic print will depend on how suitable the image used is for purpose. 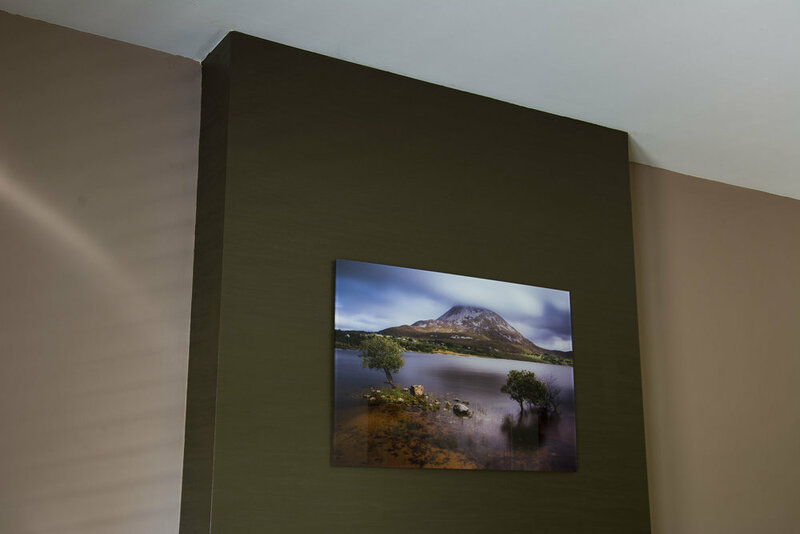 In the case of this Errigal image, the finish of this product creates a very eye catching effect in the living space in which it was installed. Even in low light, the print stands up very well to inspection and retains its colour and detail. It adds a striking and modern look to the sitting room and does not require special wall lighting for it to stand out in its surroundings. All in all, we are very pleased with the quality of this product and have no hesitation in recommending Saal Digital to other photographers. If you would like to order prints from Saal Digital, use the code "PictureIreland17" at http://www.saal-digital.co.uk/ to receive £20 off your order! Based on the successful results of our tests, we are delighted to announce that all images on Picture Ireland are now available in acrylic print format, as produced by Saal Digital! Please contact info@picture-ireland.com with the size you require for a price quotation.